A noted computer scientist has arrived at the University of Maryland to help lead the university’s expanding efforts in quantum information and quantum computing. Andrew Childs, an associate professor of computer science at UMD, is the new co-director of the Joint Center for Quantum Information and Computer Science (QuICS), a research partnership between the university and the National Institute of Standards and Technology (NIST), with the support and participation of the Research Directorate of the National Security Agency/Central Security Service. QuICS is one of 16 centers and labs in the university’s Institute for Advanced Computer Studies, where Childs has a joint appointment. Childs—an expert in quantum information processing and quantum algorithms—says he is determined to help the university make strides in the field of quantum information. QuICS is the latest addition to the university’s commitment to securing a leadership role in quantum computing and quantum information science. Officially launched in October, QuICS joins the Joint Quantum Institute (JQI), a partnership between NIST and UMD, and the Quantum Engineering Center, a partnership between UMD and Lockheed Martin Corp.
“These three centers, while separate in their primary missions, will collectively place this university at the forefront of new scientific discoveries as we move into the quantum age,” says Patrick O’Shea, vice president for research and chief research officer at UMD. Childs will share his leadership role at QuICS with Jacob Taylor, a NIST scientist and fellow in JQI. 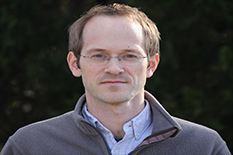 Childs joins UMD from the University of Waterloo, where he was an associate professor in the Combinatorics & Optimization department and the Institute for Quantum Computing. After receiving his doctorate in physics from the Massachusetts Institute of Technology in 2004, he was a DuBridge Postdoctoral Scholar at the California Institute of Technology. He is a senior fellow of the Canadian Institute for Advanced Research.